Hypnosis is just the cure for the many people who have a fear of spiders. Arachnophobia, the clinical name for this phobia, is even the stuff that horror movies are made of, so it is no wonder that there would be a large number of people trying to over come their fear. My Fear of Spiders Hypnosis MP3 can help! 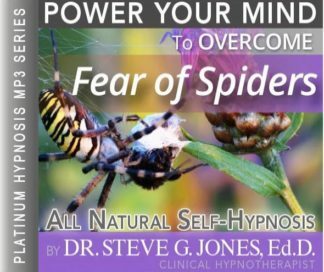 Steve G. Jones is a clinical hypnotherapist that has helped hundreds of people overcome specific fears. His program, Fear of Spiders Hypnosis MP3, will help you determine the root of your fears. Only then can you but them aside and get on with your life. Steve G. Jones is a clinical hypnotherapist that has helped hundreds of people overcome specific fears. His Fear of Spiders Hypnosis MP3 session will help you determine the root of your fears. Only then can you but them aside and get on with your life. If you suffer from a fear, or phobia of spiders, (arachnophobia), it is probably impossible to imagine being comfortable around spiders. In My practice, we have treated hundreds (if not thousands) of people with spider phobias, plus the many spider phobia cure demonstrations at our workshops. Curing a spider phobia with my Fear of Spiders Hypnosis MP3 audio is easy, and you can have access to this amazing technique now. Finding a good arachnophobia treatment is important, particularly if you live alone. Imagine suffering from this fear and finding a huge spider lodged in your bedroom one night! Short of calling out a relation to come and remove it you would have to give up your bed for the night – some people would even consider vacating the house altogether! You may thing that this is a phobia you’ll never be cured of, but there are ways to reduce this fear. My hypnosis for fear of SPIDERS MP3 has been used as an effective arachnophobia treatment, and many people have found it very effective. If you want to take control of your life and try and put a stop to this phobia, hypnotherapy could be the fast, effective treatment that you are looking for. Steve G. Jones, Ed.D., Clinical Hypnotherapist, charges $1,500 for a custom recording and $25,000 for a one-hour private hypnotherapy session at his office. But you can get all the benefits for this low price. Simply listen to the Fear of Spiders Hypnosis MP3 download every night as you go to bed for three weeks and feel the changes happening in your life. You will feel more empowered, more in touch with your true self, and you will truly know that your goals are within your reach. And as you continue to relax you now imagine yourself in a movie theater. And you imagine yourself running the projector, that’s right. There you are in the projection booth running the projector and as you look down, you see the seats in the theater and in the front seat you see yourself sitting down watching the movie. And as you look at the screen you realize that yourself is watching you in the movie. And on the screen you see you in the movie, that’s right. And you are so relaxed and safe and protected in the projection booth. And as you watch yourself watching you, you realize the movie is about you enjoying a wonderful day and you see yourself watching you. You see you on the screen, that’s right. Yet you are in the projection booth safe and protected and you now see you on the screen walking along, walking along, that’s right. It is a beautiful day, a beautiful, wonderful day. And up ahead there is a tree and there is a branch coming from a tree and there is what appears to be a web, a web on the tree, connecting the branch to the rest of the tree. And you are very safe in your projection booth watching yourself watching you. And you now see you on the screen getting closer and closer to the web. It is definitely a web and there is a spider on the web and you see yourself sitting in the front row of the theater watching you on the screen. And you on the screen in the movie stop two feet away from the spider and its web. And you smile because you are so relaxed around spiders, that’s right. And now you see you in a different scene in a home where there is a spider on the wall and you are so relaxed. You are two feet from the spider and smiling and relaxed. And now if you so desire you can imagine yourself in the front row, that’s right. You have left the projection booth and you now see the screen from the front row where you had been sitting all along, that’s right. And you are watching you on the screen. You on the screen are standing two feet away from the spider and smiling in a different scene now. You are so relaxed, so at ease. And at anytime you can imagine yourself back in the projection booth safe and protected, yet you are safe and protected sitting here in the front row of the theater, very relaxed and happy and calm. And now if you so desire you can imagine yourself in the movie seeing the spider from the point of view of you in the movie. The spider is two feet away from you. You are relaxed and smiling and at any time you choose, you can return to the front row of the theater or to the projection booth and you are so relaxed. All three of these people are you and no matter which position you are in, projection booth, the front row, or the movie itself, you are so relaxed, so at ease, so calm, so calm, so relaxed, that’s right. So relaxed and day by day you are becoming more and more comfortable around spiders. You take necessary precautions, yet you are relaxed around spiders. You always take necessary precautions when interacting with spiders, yet you are relaxed when you interact with them. You are relaxed and at ease and becoming more and more relaxed around spiders day by day as you continue to relax now. Some scientists argue that the fear of spiders is a learned trait. We see others are scared of spiders when we are young and the fear starts to grow inside of us. Some people have very strong reactions when they see spiders. Some people get anxious or have sweaty palms and some people have full blown panic attacks. No matter how severe your fear is, it is important to realize that hypnotherapy is a safe and natural way for you to overcome your fears. With the Fear of Spiders Hypnosis MP3 recording, you will realize that YOU are in control of your fears. Hypnosis will make you realize that there is no reason to be scared of them. Hypnosis works by targeting your subconscious mind. Positive suggestions and emotions replace the negative emotions of your fear of spiders. This powerful hypnosis session will have you imagine that you are in a movie theater and on the projection is a spider. The relaxing voice of Steve G. Jones will walk you through the emotions you should be feeling while at the same time eliminating negative reactions. 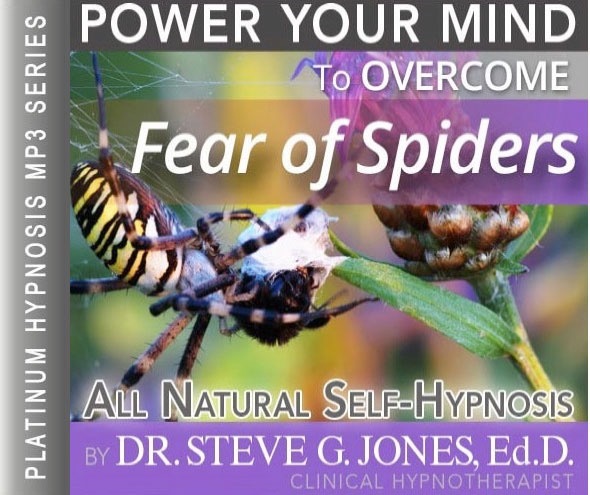 With repeat listening of this hypnotherapy MP3, your fear of spiders will begin to diminish until you have no fear at all in relation to spiders. Hypnosis is a powerful tool to use to change any thought, emotion, feeling, action, or fear. You should listen to this Fear of Spiders Hypnosis MP3 recording for 21 days in a row before going to bed and you will soon learn to accept spiders without fearing them. If you fear spider, this recording will change your life! No longer will you feel anxious, nervous, or fearful of spiders. You will feel calm, collected, and patient around spiders.